Update: This session will address how to select the right tools and strategies for financial benchmarking in clinical development. This session will provide an overview of TrialValue A.I.+ and how the model is used at the early stage of clinical program design for financial planning, complexity analysis, budget development and cost benchmarking. Audience: Heads of Clinical Development, Project Directors, R&D Finance, CFOs, Clinical Operations, Procurement, Program Planning, Business Development, Investors and Commercial Teams. Additional details will be sent to all registered participants closer to the time. Maximum number of places available: 15. Minimum number required for the session to take place is 8. Please provide some information about your company, role and any specific needs or questions that you would like to address. This session will address how to select the right tools and strategies for financial benchmarking in clinical development. Audience: Clinical Development, Finance, Medical Affairs, Management, Procurement, Outsourcing and Operations. Meeting details will be sent to all registered participants two weeks before the event. TrialValue will be hosting a Lunch and learn session on the topic of budget optimisation using human-machine learning algorithms. Attending annual event and will be providing updates on TrialValue A.I - our new Machine Learning enabled benchmarking algorithm. Looking forward to the clinical outsourcing event of the year. Blinded results of Budget Challenge to be announced. 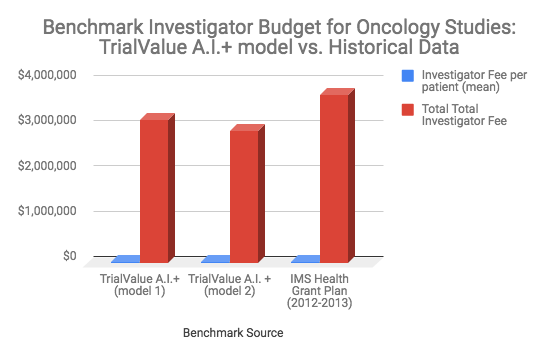 Clinical Trial Budget Efficiency Challenge - Are you getting value for money? Clinical research projects are costly and budget overruns are common. Teams often feel dissatisfied as their studies end and see their projects haven't delivered good value for money. What's the remedy to this "buyers' remorse"? Take the TrialValue Budget Challenge to see how your project compares with our optimal budget benchmark, peers and the industry's best. You'll get a free budget analysis report and tips on how to extract more value from your clinical project. Clinical trial teams in pharmaceutical and biotech companies, CROs and academic research organizations. Together, we can transform the clinical development enterprise. Challenge starts on 20 November and runs until 20 April 2018 (period extended by 2 months). Blinded results will be published by May 30, 2018. All information provided will be treated as confidential. Note: This research challenge is for educational purposes only. Audience: Biotech, clinical stage companies, small/mid-size pharma, Sites, Academic research organisations and CROs. Functions: Clinical Research/Operations, Finance, Procurement, Business Development, Program/Project Management, Medical Affairs, and Executive management. Together, we can add value to the clinical development enterprise. Larry Ajuwon, Director, Rhieos-Ventures and Lead Partner at the TrialValueapp will present the platform and discuss the new approaches, practices and tools for planning and reducing the costs of clinical development projects.